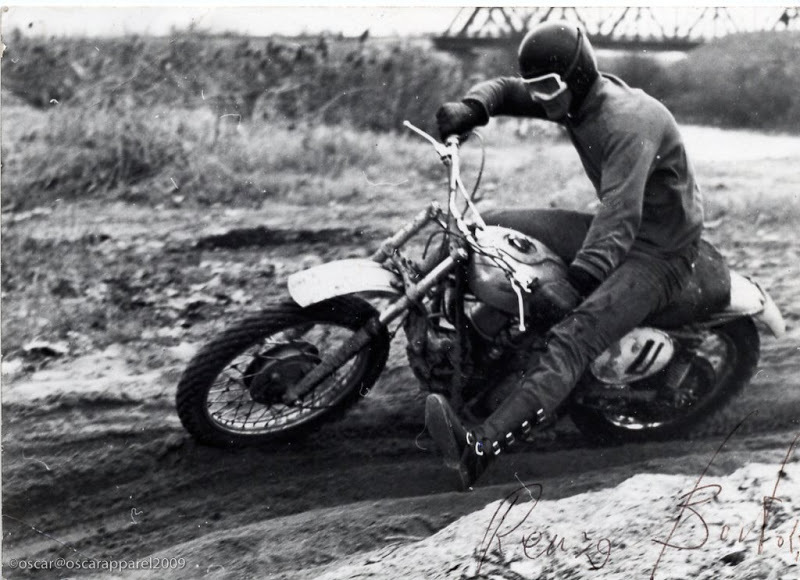 Many motorcycle historians believe the first motocross race was held in England in 1924. Today’s motocross riders and fans probably wouldn’t recognize the bikes the bikes the riders rode or the gear they wore compared to what is used today. In that race, which traveled one way and without laps through farms and fields, the motorcycles were little more than bicycles with gas engines attached. In terms of race gear, most of the riders in that race had on heavy leather pants, over-sized driving gloves and, if they had a helmet, it was a metal helmet more fit for the infantry than racing. In the years and dirt-slinging miles since then, the bikes have gotten faster, the courses more sophisticated, and motocross gear has dramatically improved in terms of safety and utility. When decked out for a race, today’s driver would seem to have much more in common with a professional football player than with those riders of old. From the ground up, everything the rider wears has been designed specifically for the demands of motocross. Motocross boots, though surprisingly light in weight, provide both protection and rigid support for the riders feet and ankles. 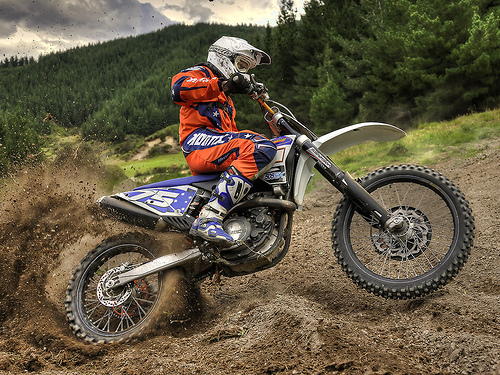 Motocross pants, which are often adorned with a sponsor’s colors and logo, are usually composed of some type of heavy nylon blend with extra protection for the knees and the insides of the legs, which hug the engine as it heats up throughout each race. Under the pants, riders usually have additional knee protection. Until recently most riders wore knee pads, but many riders now wear a more protective knee brace. Like pads, braces have a hard outer shell cushioned with padding to protect the knee from contact, but unlike pads, braces are designed to provide stabilization and support to minimize the risk of the knee being twisted, damaging ligaments and tendons. Under, or in some cases over, the sponsor-themed jerseys, today’s riders sport high tech body armor. This armor includes a chest protector to shield the rider from rocks and other painful debris thrown up in the roost of the riders ahead. Roost is the term used to describe the rooster-tail-shaped barrage of dirt and debris churned up by the torque of a motorcycle’s rear wheel. Often, the body armor also includes protection for the rider’s kidneys, shoulders, and biceps. Elbow pads are also worn to protect riders. Motocross helmets have a look all their own, with an open face design suitable for use with the obligatory goggles, chin protection including a chin bar and a visor. These helmets are not as sleek or as aerodynamic as those worn by road racers, where speeds are higher but riders need not worry about any roost coming from the leaders. The helmet’s design provides a little cool air for the driver and plenty or room for the eye-saving goggles and the visor not only helps reduce the blinding sun, but also serves as a roost shield when riders tilt their heads down slightly while in heavy traffic. As another layer of protection, lately many riders are also donning specially designed neck braces. Finally today’s gloves are incredibly form fitting marvels with padding and protection for the exposed top of the hands, and extra grip for the palm and fingers. As one can see the gear has evolved over the year, and like the sport itself, is built for speed and excitement. This entry was posted in Land Sports, Motocross and tagged History, Motocross. Bookmark the permalink.